Special delivery of crafts, games, early science, and language activities for your group! Explain how the postal system works, from the mailbox, to the sorting office to the letter which arrives at their front door or at the post office. Postcard(Open postcards) Print and laminate the models. The pictures may be used as a memory game or to spark a conversation with your group. Use them to decorate your daycare or a specific thematic corner. (Open picture game-Postal services) Print, laminate, and store in a "Ziploc" bag or in your thematic bins. This theme is perfect for exploring various means of transportation. Letters can be transported many ways... cars, trucks, airplanes, trains. Wooden blocks can be used to build a post office. Cardboard boxes (shoeboxes) can be decorated to look like mailboxes. Stamps and stamp pads are perfect for this theme. Stickers off all kinds can replace stamps on envelopes. Different types of paper may be used to prepare original letters. Coloring pages related to the theme. Creative coloring activities related to the theme. Children will love pretending to work in a post office. Provide blue shirts, caps, and a mailbag for the costume. Add envelopes, stickers, crayons, stamps, boxes, and office material to your role play area. You may create your own mail truck using a large box. Memory game using educatall.com picture games. 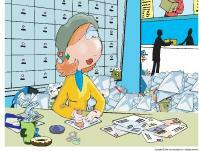 Objects related to postal services... your mailman can help you here! Books about various jobs and professions. Posters of stamp collections...your local post office can most likely provide you with free samples. The flashcards may be used to spark a conversation with your group, in your reading and writing area, or to identify your thematic bins. (Open word flashcards - Postal services) letter, stamp, postcard, mailman, mailbox, stationery, envelope, mailbag, package, delivery truck, postal code, address. Organize an obstacle course throughout which children must transport a letter or package to its final destination without dropping it. Simply set up a tunnel, hoola hoops to jump in, a balance beam, etc. Keep the physical capacities of the children in your group in mind. Invite children to follow you, single file, and imitate you. Begin by walking toward the post office. Transport your mailbag on your shoulder. Lean to one side to show how heavy your bag is. Change direction to walk towards the houses. Pretend to take letters out of your mailbag. Count the letters out loud and use your fingers. Distribute the mail, pretending to give each child a letter. Have children crawl under the legs of chairs, under a coffee table, under a rope attached to two chairs, have them leap over an exercise ball, etc. Children take turns playing the role of the mailman and pretend to distribute mail. Glue the letters of the alphabet on the floor. Children sing the alphabet while jumping on the corresponding letters. Take a walk in your neighborhood with your group and search for mailboxes... on street corners, on each house, etc. When you are done, have children draw one of the mailboxes they saw. Ask parents to write a letter to their child during the theme. You may ask parents to actually mail their letter to the daycare or use a mailbox set up within the daycare. At the end of the week, choose a calm period to read the letters to the children. Make sure each child has a letter. Ask parents to accompany you on a visit to the local post office. You may only have a postal counter nearby but if you ask, the employee will most likely be happy to provide a brief explanation of how everything works. Ask parents to collect envelopes they receive at home for use throughout the theme. Children will love looking at the different types of stamps, envelopes, etc. (Open magnifying glass game - Postal services) Print and laminate the board game and the illustrations. Cut them out and store them in a box or in a plastic bag. Children pick an illustration and search for it on the board game, using a magnifying glass. Once they have found a match, they deposit the illustration in the correct square, on the board game. (Open sequential story - Postal services) Print and laminate the sequential story. Let children have fun placing the illustrations in the correct order to recreate the story. (Open educ-association - Postal services) Print the pages and follow the instructions included in the game to assemble everything in a file folder. Children must associate the illustrations according to the instructions on the board game. Once they have found the correct association, they must deposit it in the corresponding square using Velcro or adhesive putty. Provide children with stationery so they can write their own letters, place them in envelopes, and deposit them in a mailbox within the daycare. (Open game - postal codes) Print. Cut out and laminate the number and letter cards. Have children reproduce various postal codes. This is the perfect occasion to teach children their own postal code. (Open hunt and seek - Postal services) Print and laminate. Children pick cards and search for the items in the large illustration. 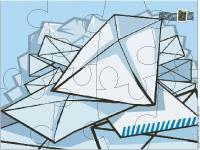 (Open puzzles - Postal services) Print, laminate, and cut out. Children must place the pieces correctly to complete the puzzles. Provide stationery, different types of crayons, an old typewriter, envelopes, etc. Encourage children to write. Use any type of paper you may have on hand. Transform your pre-writing area to look like a post office. Add a desk, a chair, envelopes, stickers, stationery, a mailbag, a mailbox, pencils, stamps, etc. The more tools you offer, the more children will enjoy practicing to "write". Thank you Mr. Mailman. Fill an envelope with drawings and give it to the mailman to thank him for his good work. Set a scale on a table and provide children with packages they can weigh and compare. Ask them to identify the lightest and heaviest packages. Explain how the weight of a package determines the cost to send it to its destination. Fill a bin with different types of envelopes to show children how many different kinds of envelopes there are. Include paper envelopes, padded envelopes, onion peels, orange peels, fabric envelopes, etc. Combine hot water and gelatin in a bowl. Using the paintbrush, spread a thin coat of the mixture behind the picture you wish to make a sticker with (magazine cutout, picture, etc). Children are big fans of stickers! They will love this activity and the best part is...it's simple! Deposit each child's snack in a box. Wrap and label the box like a real package. Ask another caregiver or adult to deliver the snacks. You will need cardboard, markers, magazines, scissors, and glue. Ask children to decorate one side of the cardboard by drawing on it or by gluing various items to it. When they are done, write a short message on the back along with each child's address. Mail each child's postcard to his home or to a daycare friend. Use a 5 inch x 8 inch piece of cardboard per child. Ask children to cut around the contour using fancy scissors. Next, let children draw on their stamp. Remind them to add the cost of the stamp in the upper right-hand corner. Once all the children are done, laminate the stamps and display them in the role play area. Use tiny squares of adhesive paper (Mac-Tac). Let children draw their own stamp models. When they are done, invite them to stick their stamps on real envelopes or on a large crafted envelope. Provide each child with a fabric bag. Let them decorate the bag as they wish using arts & crafts materials, glitter glue, etc. They will love their unique mailbags. Ask parents to provide a shoebox. Have children decorate their box as they wish. Children may use their box as a message box within the daycare or at home when they are done. Cut a large piece of white paper. Transform it to make it look like a giant envelope. Invite children to decorate and address the envelope. Hang it in your daycare throughout the theme. Parents may add to the envelope too! (Open creative coloring - Postal services) Print for each child. Ask them to complete the picture by drawing their dream destination on the postcard. 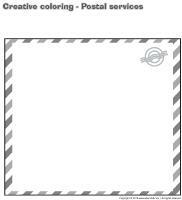 (Open coloring pages theme - Postal services) Print for each child.